The Peace Center’s address is 300 South Main Street, Greenville, SC 29601. The building sits on the corner of Main Street and Broad Street in Downtown Greenville. Take exit #51C onto I-385 Downtown Greenville. Stay on I-385 until you reach downtown Greenville. Turn left at the 3rd traffic light onto Main Street. The Peace Center is on your right, on the corner of Broad Street and South Main Street (about five blocks). Take Hwy 25 South to Greenville. After Travelers Rest, take the left fork (Business Hwy 25). Business Hwy 25 becomes Poinsett Highway. Stay on Business Hwy 25 until you reach Hwy 183. Turn left at the traffic light onto Hwy 183. Turn right at the 5th traffic light onto Main Street. The Peace Center is on your right, on the corner of Broad Street and South Main Street (about four blocks). Hwy 123 turns into Academy Street. Turn right onto McBee Avenue. Turn right onto River Street. Turn left onto Broad Street. The Peace Center is located on the corner of Main Street and Broad Street. 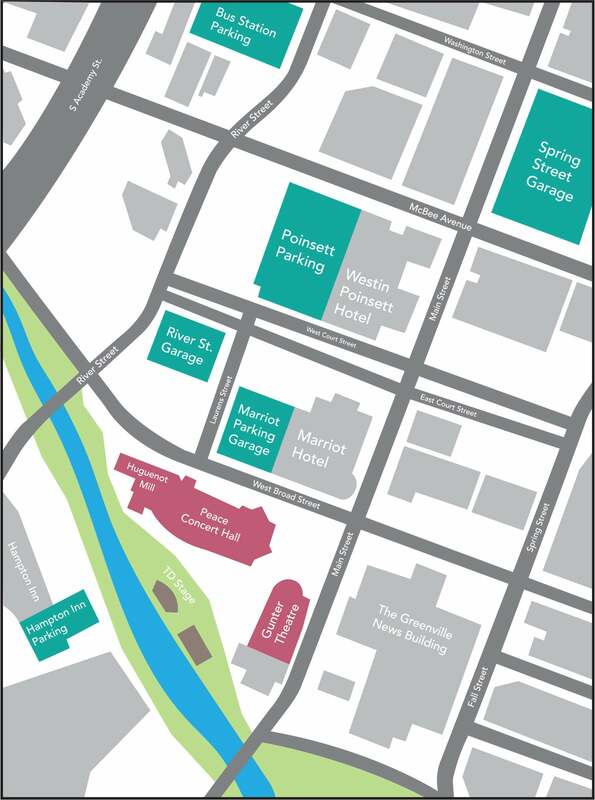 Click here for a listing of the available city-owned parking garages and lots in downtown Greenville. For accessible parking information, please click here. Get a map of the Peace Center and surrounding garages by clicking here.